Managing Diabetes can be difficult on the health and quality of life of the patient. In addition, Diabetes can lead to a very painful condition known as diabetic neuropathy. The high blood glucose levels associated with diabetes can damage nerves and result in a burning pain and numbness, particularly from the legs and feet. It affects the majority of long-term diabetes patients. This is not only painful but is also disruptive to the normal life functions of these patients. There are no cures, but diabetic neuropathy can be prevented by blood glucose control in the diabetic patient with a rigorous program of measured diet and exercise. Treatment for diabetic neuropathy usually involves pain management with drugs. Mindfulness practices have been shown to help with pain management and with quality of life in diabetes patients. It is possible, then, that mindfulness practices may be effective in reducing pain and improving quality of life in patients with diabetic neuropathy. In today’s Research News article “Randomized Trial of the Effect of Mindfulness-Based Stress Reduction on Pain-Related Disability, Pain Intensity, Health-Related Quality of Life, and A1C in Patients With Painful Diabetic Peripheral Neuropathy.” (See summary below or view the full text of the study at: https://www.ncbi.nlm.nih.gov/pmc/articles/PMC5734176/ ), Nathan and colleagues examined the effectiveness of mindfulness training on reducing pain and improving the quality of life in patients with Painful diabetic peripheral neuropathy (PDPN). They recruited adults with Type II Diabetes and with Painful diabetic peripheral neuropathy (PDPN). The participants were maintained on their usual pharmacological treatments and randomly assigned to a wait-list or to receive an additional 8-week program, once weekly 2.5 hour sessions and home practice, of Mindfulness-Based Stress Reduction (MBSR). The mindfulness program consists of group discussion and training in sitting, walking, and body scan meditations, and yoga practice. They were measured before and after training and 3 months later for pain related disability, pain severity, pain catastrophizing, health related and diabetic neuropathy related quality of life, depression, diabetes self-care, blood sugar reactions, and A1C levels, a measure of long-term blood glucose control. They found that in comparison to baseline and the wait-list control, the participants who received Mindfulness-Based Stress Reduction (MBSR) training had significantly improved scores on all measures including lower pain related disability, pain severity, pain catastrophizing, depression health related and diabetic neuropathy related quality of life, diabetes self-care, blood sugar reactions, and A1C levels. These improvements were maintained at the 3-month follow-up. In addition, there was a high retention rate with 94% of the treated patients completing the 8-week training and the 3-month follow-up. These results are striking and important. Diabetic Neuropathy is a torment for Type II Diabetes patients and mindfulness training was found to markedly improve this condition. It increased quality of life and health and decreased pain and pain associated psychological and physical difficulties. 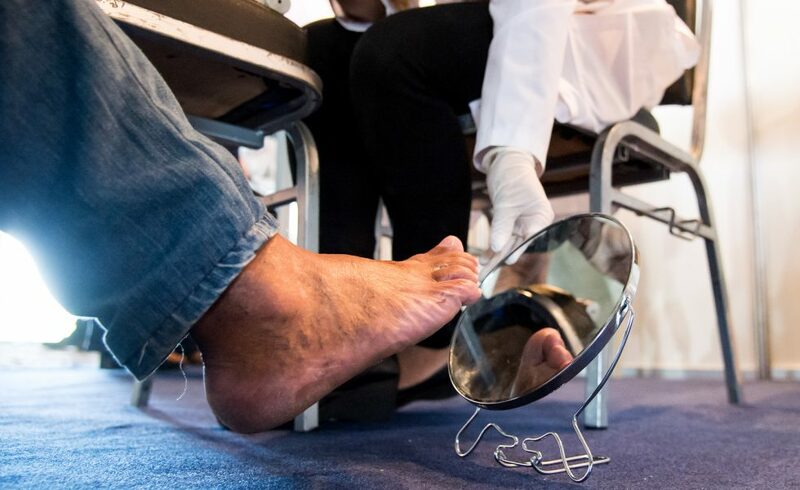 This relief of suffering in important and remarkable and should lead to a recommendation for mindfulness training to be included in the usual care of patients with Painful diabetic peripheral neuropathy (PDPN). So, reduce painful diabetic neuropathy with mindfulness. Nathan, H. J., Poulin, P., Wozny, D., Taljaard, M., Smyth, C., Gilron, I., Sorisky, A., Lochnan, H., … Shergill, Y. (2017). Randomized Trial of the Effect of Mindfulness-Based Stress Reduction on Pain-Related Disability, Pain Intensity, Health-Related Quality of Life, and A1C in Patients With Painful Diabetic Peripheral Neuropathy. Clinical diabetes : a publication of the American Diabetes Association, 35(5), 294-304. IN BRIEF Painful diabetic peripheral neuropathy (PDPN) has a large negative impact on patients’ physical and mental functioning, and pharmacological therapies rarely provide more than partial relief. Mindfulness-based stress reduction (MBSR) is a group psychosocial intervention that was developed for patients with chronic illness who were not responding to existing medical treatments. This study tested the effects of community-based MBSR courses for patients with PDPN. Among patients whose PDPN pharmacotherapy had been optimized in a chronic pain clinic, those randomly assigned to treatment with MBSR experienced improved function, better health-related quality of life, and reduced pain intensity, pain catastrophizing, and depression compared to those receiving usual care.